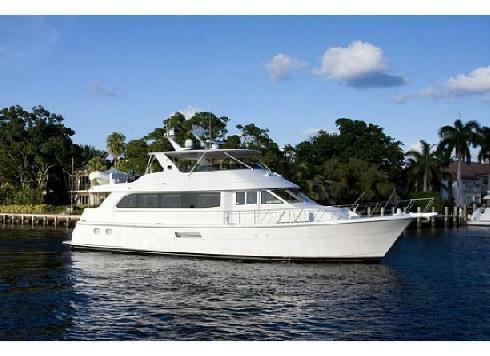 Motor yacht AVANTI was built by Hatteras in 2002, she measures 22.9 meters (75ft), can accommodate 8 guests in 4 cabins and is based in Florida / Bahamas in the winter and the East Coast of USA in the summer. 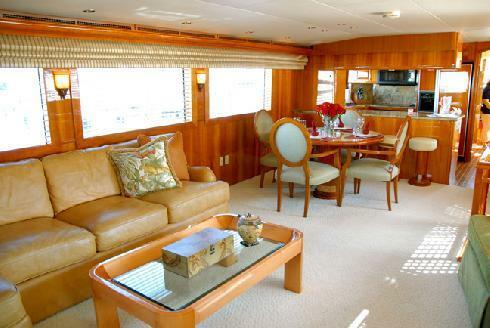 The AVANTI motor yacht has a comfortable classic style interior flanked by high gloss wood and large picturesque windows, the salon features a leather settee on the port side complimented by a glass coffee table and 2 large chairs on the starboard side, forward of the salon is the formal dining table. 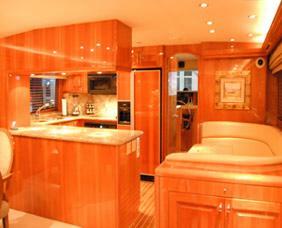 The galley is port and forward of the dining space separated by a marble bar top with stools, adjoining the galley to the starboard is a casual dining table. 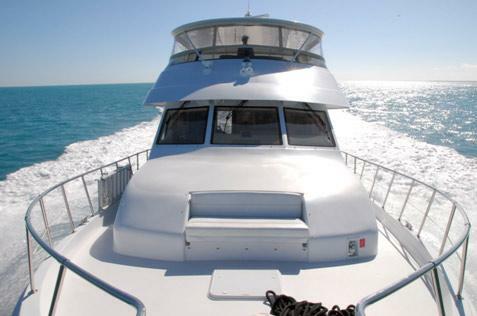 Charter yacht AVANTI offers plenty of external deck space, the aft deck can be accessed from the salon and boasts an alfresco dining option and additional seating, and beyond this a wide stainless steel gate allows easy access to the swim platform. 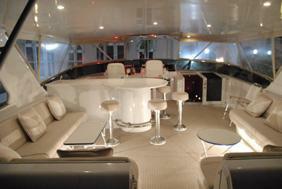 Above decks the fly bridge is voluminous, complete with a cocktail area, drinks bar and Spa Pool tub. 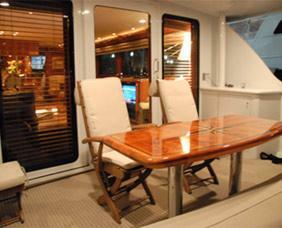 In innovative Hatteras style the seating and bar are given a covered or non-covered option. 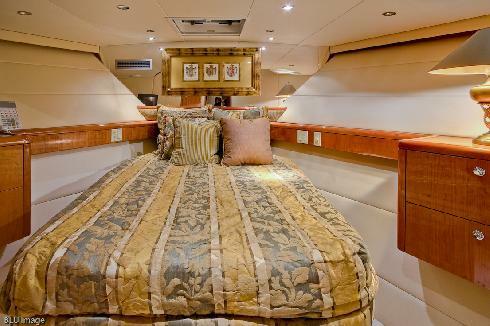 Motor yacht AVANTI offers guests 4m Tender with a 60 HP engine, Games Console, SAT TV, Local TV, DVD Library, CD Library, iPod Dock, DVD, Stereo and BBQ. 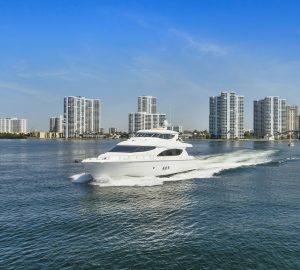 M/Y AVANTI has a beam of 6 meters (19.7ft) and a draft of 2 meters (6.5ft) and cruises at a speed of 23 knots with maximum speeds of 26 knots. 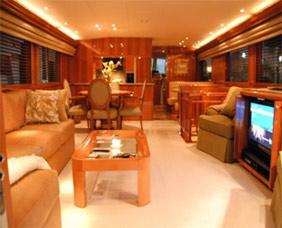 Charter yacht AVANTI comfortably accommodates 8 guests in 4 cabins. 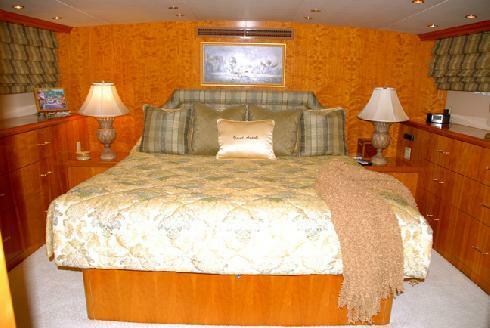 The Master cabin has a king size bed, Spa Pool bath/tub and en-suite facilities, the VIP cabin has a queen size bed, Spa Pool bath/tub and en-suite facilities, a further guest cabin has a queen size bed with en-suite facilities, while the remaining guest cabin has 2 single beds and en-suite facilities. 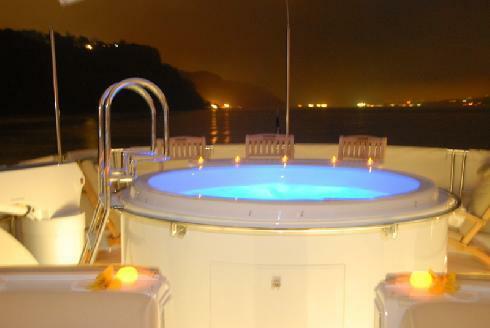 M/Y AVANTI provides guests with a 4m Tender with a 60 HP engine, Games Console, SAT TV, Local TV, DVD Library, CD Library, iPod Dock, DVD, Stereo, BBQ, 2 in cabin Spa Pool tubs and a deck Spa Pool.